If you’re thinking of where you should send your mare this spring, there are 4.3 good reasons why you should book her into Shinzig. That’s the margin Lil Mer won by at Hastings in New Zealand on Saturday and, based on that effort, there will be plenty more wins in store. This is a very good filly. Hastings was her fourth outing and she had a pair of seconds leading into the race, so Lil Mer is definitely on the way up. 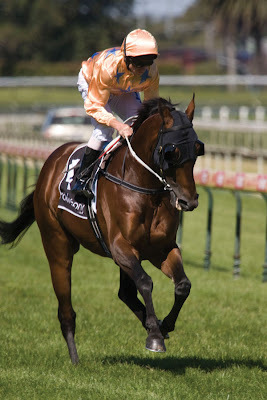 It would be somewhat fitting if Lil Mer rises rapidly through her classes in the Shaky Isles: Shinzig (below) campaigned extensively in NZ with a number of Group One placings before returning across the Tasman to take out the Group One CF Orr Stakes and eventually retiring to Eliza Park. Lil Mer, along with the stakes winner, Psychic Mick, both hail from Shinzig’s first crop. Lil Mer is out of out of the Festival Hall mare, Indeed, a half sister to Kiwi stakes winner Ascot Isle and closely related to New Zealand Group One winner Little Jamie. Bred in Australia and leased to Stephen Seketa (St Elmo Racing), Lil Mer is named – in part – after the breeder’s granddaughter, Lily.